Hip/Elbow Dysplasia: In dogs affected with hip dysplasia the hip joints and/or elbow joints do not form correctly as the puppy grows. 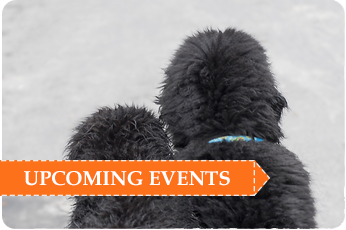 Affected dogs range from mildly to severely affected. Those who are mildly affected often do not need much treatment when young, but will develop arthritis as they age. Usually anti-inflammatory medications and joint support supplements are effective. If young dogs are more severely affected, they may require medications and possibly surgery, including total hip replacement, at a younger age to enable the dog to live pain free. Dogs must be xrayed in order to diagnose hip and elbow Dysplasia; a positive diagnosis cannot be made simply from watching the dog move. There are three main certifying agencies in North America: the OFA and GDC in the U.S. and the OVC in Canada. 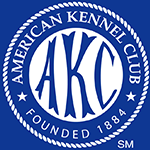 The OFA and the OVC require dogs to be two years of age, while the GDC will certify at a year (though they recommend waiting until the dog is older. Dogs free of hip dyplasia receive a rating (excellent, good, fair/acceptable). 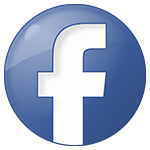 Dogs free of elbow dysplasia receive a normal certification. The results are available on the Internet (www.offa.org, www.ucdavis.edu). Please note: The certification rates only the individual dog and DOES NOT guarantee that dog will not produce a dysplastic puppy. The likelihood of producing this disease can be minimized by considering both depth (number of ancestors) and breath (number of clear littermates and parents littermates) in the pedigree, as well as any offspring prior to selecting a mate. 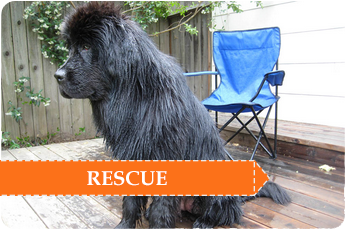 Elbow anomaly: This is a newly discovered disease in Newfoundlands and has not been written up in any books. 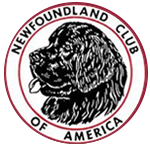 The Newfoundland Club of America is supporting research at this time. In this disease the bones in the front legs, the radius and ulna, grow at uneven rates and the elbow joint becomes dislocated. It must be diagnosed by radiographs, and sometimes can be diagnosed as early as four weeks. As the dog grows the front leg(s) bow out in a curve. This condition is considered hereditary although the genetics are not yet understood. 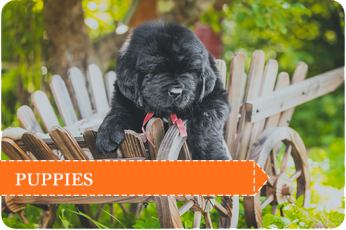 To date, there is no reliable surgical treatment and affected puppies are usually euthanized. Osteochondrosis, Osteochondritis Dessicans (OCD): This is a disease of joint cartilage in shoulder, stifle, hock or elbow that occurs usually in young, fast growing dogs. Males seem to be more frequently affected than females. The cartilage surface gets damage, and in more severe cases, a flap of cartilage is created. Sometimes this flap comes loose and forms a chip within the joint. The chip can be removed surgically with fair to excellent results, depending upon which joint is affected. Dogs with this problem usually are lame in the affected leg at sometime during their youth. Panosteitis (Pano): This is a painful inflammatory bone disease of young, rapidly growing dogs. Pano causes lameness in the affected limb and the lameness may "rotate" among all four legs. It is usually a self-limiting condition that most dogs outgrow. The dog may require some limitation of activity, i.e. no free play, and anti-inflammatory medication if the pup is very painful. Pano commonly occurs between 6 months and 18 months, but is known to occur in older dogs, and tends to run in families. Ruptured Cruciate Ligament: This ligament stabilizes the dog's knee or stifle joint. A sudden rupture of the ligament causes sudden lameness in the rear (i.e. holding up one rear leg or a severe limp) while a partial tear may be subtle, with only mild lameness and muscle wasting apparent on the affected side. This problem may have some genetic basis, frequently occurs in middle-age dogs, but is also a common twisting injury. Strains and partial tears may respond to rest, medication and rehab while more severe damage will require surgical repair. The newer TPLO or TTA repairs gives good to excellent results.